Around the time that Jack Purcell and his crew were on active service with 467 Squadron (January – May 1944), Bomber Command was routinely sending forces numbering six or eight hundred aircraft on large-scale raids against German cities. Even the ‘smaller’ raids on French targets still involved a couple of hundred aircraft each. Landing everyone safely at their airfields after the operation, in the dark, with no lights or radar, and contending with fatigued aircrew, battle damage and the odd German intruder attack, required the development of some remarkably sophisticated and highly efficient systems, and thus laid the foundations for what we now know as air traffic control. 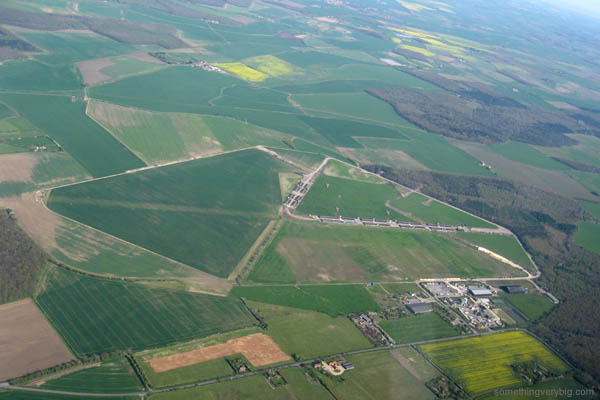 There were a number of local variations depending on which Group the airfield fell under, but the basic procedure was that incoming aircraft would call up the control tower as they approached their home airfield to identify themselves. Flying Control would respond with instructions to either land immediately if there was no-one in front of them, or to circle the airfield, stacked above earlier arrivals at 1,000’ intervals. As No. 1 was in the circuit at 1,000’ and preparing to land, No. 2 would be circling at 2,000’, No. 3 would be at 3,000’ and so on. No. 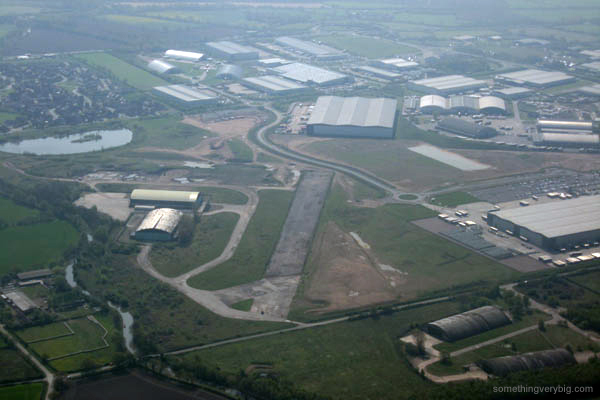 1 flew around the circuit, following the ‘Drem’ lights located around the airfield, and the pilot would report on the radio as he passed each position: ‘crosswind’ as he passed over the upwind end of the runway, perpendicular to it; ‘downwind’ as he passed the mid-point of the runway, flying parallel to it (which is also where he would begin a slow descent from 1,000’ to land), and ‘funnels’ as he made the final turn to line up with the runway, facing into wind. 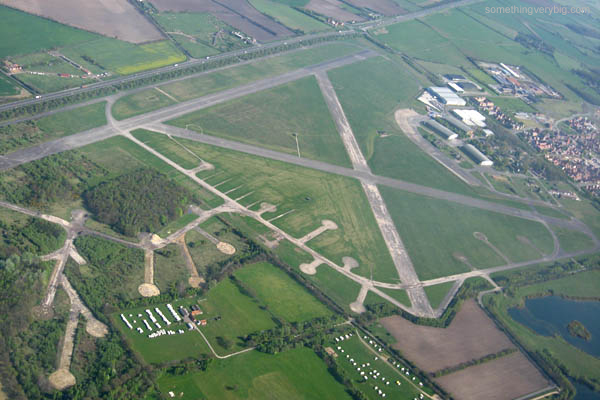 Then he would wait for the green light from the aerodrome controller (who was located in a caravan parked next to the landing end of the runway) before landing and taxying off the runway to dispersal. Meanwhile, No. 2 became No. 1 and would leave the stack. He would adjust his circuit spacing and speed to position himself one reporting position behind the aircraft in front. As each aircraft left the bottom of the stack, everyone else still circling above them could be stepped down a level until, in turn, they were at the bottom and next to land. Arrival over base could be inside 10/10ths cloud. In this case, according to 49 Squadron veteran rear gunner Hugh McLeod, the navigator would use the ‘Gee’ navigation aid to home in to the airfield. He would be calling instructions to the pilot in much the same manner as the bomb aimer would while over the target: “Starboard a bit, Skipper… hold it there… should be coming into view now”. 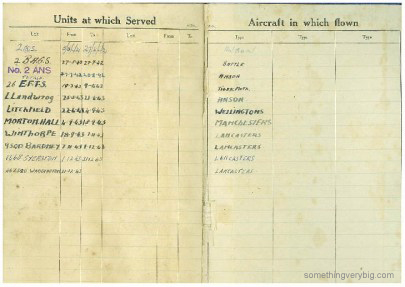 Hugh says it was accurate enough to take the aircraft all the way to ‘funnels’ – quite astounding accuracy for the time. In the event of an intruder alert (“this happened to me on three occasions,” Hugh said), an emergency call would come over the radio, lights everywhere would be turned off and the arriving bombers would all scatter until the all-clear sounded or they diverted to other ‘dromes. Had to circle base for 40 minutes before landing. Quick Landing Scheme disappointing. 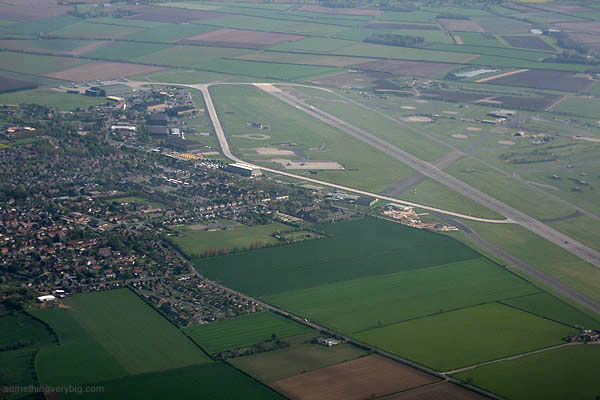 During this hour, thirty aircraft landed at Waddington. The longest gap between arrivals is five minutes (it comes immediately before Quartermaine landed). Without a modern-day radar controller judging approach paths and in darkness, the odd ‘blow out’ of a few extra minutes in the landing sequence is quite understandable. Shorter intervals are far more common and, assuming the times recorded in the ORB are indeed accurate, there were an amazing three arrivals in a single minute at 00.15. Tellingly, this was about 40 minutes before Quartermaine landed, so was quite possibly about the time that LM338 arrived overhead – to find a large stack of aircraft already awaiting their turn to land. In the next 40 minutes, as Quartermaine and his crew circled overhead the field, a total of 21 aircraft landed. At a rate better than one aircraft every two minutes, this is actually a reasonably efficient use of the runway given wartime conditions (blackout, no lights, no radar control, fatigued crews etc). There is insufficient evidence about the timing of when other aircraft arrived over the field, but there is a good chance that other captains faced similar waiting times. So while P/O Quartermaine may well have felt a little hard-done-by having needed to wait for so long, it was a simple case of too many aircraft arriving at once and not enough runways for them to use. This basic cause of airborne delays is still a common occurrence in modern-day air traffic control. Nothing ever changes… someone still has to wait! 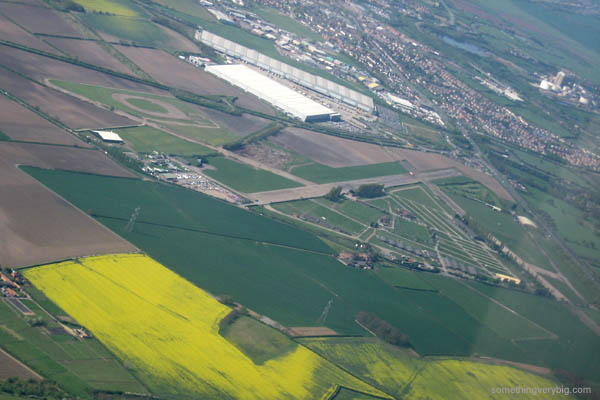 Descriptions of aerodrome control come from C07-014-123, The Trenches in the Sky by Dan Conway, and C07-050-023 Takeoff to Touchdown by Don Charlwood. Hugh’s recollections were related in a phone call in May 2013. 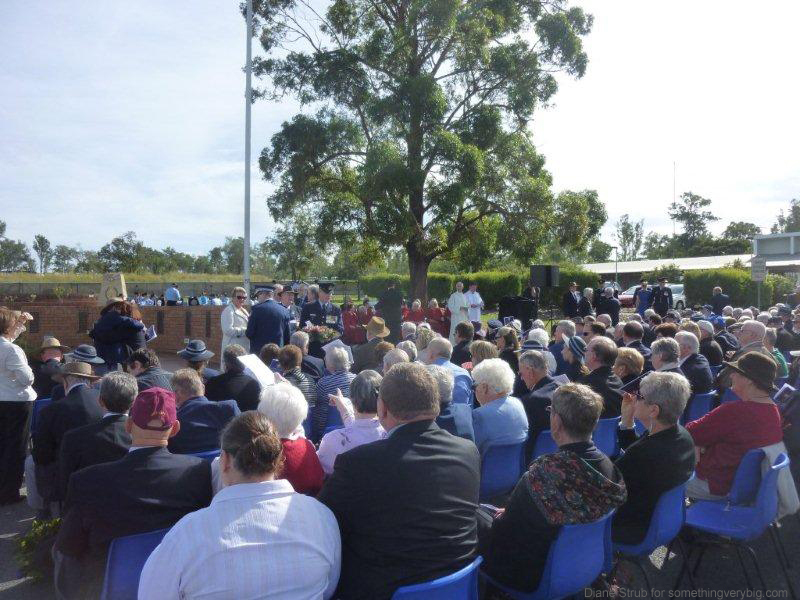 While many of us were in Canberra last weekend for the annual Commemorative Day Weekend, simultaneous events were also being held elsewhere around the country. 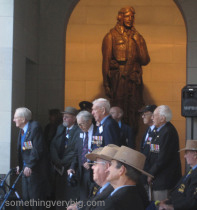 Groups of veterans, families and interested others gathered to remember the men and the deeds of Bomber Command at ceremonies held in Sydney, Adelaide, Melbourne and Brisbane. It looks like a fair-sized crowd was there, with a good number of veterans present (I counted 23 in the above photo). Everyone looks a little warmer than we were in Canberra! Good show, Brisbane. And thanks to Diane for the photos. It was a very wet weekend in south-eastern Australia. It rained so much in Adelaide on Friday that the automatic rain gauge at the airport gave up. 70mm fell in Melbourne on the same day. It was still raining when I walked to the train station in Sydney on my way to the airport on Sunday morning and, as we were taxying out, the heavy jets weren’t so much ‘landing’ as ‘splashing down’. We were in cloud all the way to Canberra. Things were not looking good for the sixth annual Bomber Command Commemorative Day. Though the tarmac was noticeably wet on arrival, the sky showed signs of clearing as I took a taxi to the Australian War Memorial. On arrival I discovered that, because the grass near the Bomber Command sculpture was still rather squelchy underfoot, the ceremony had been moved to the Commemorative Area within the War Memorial itself. As the clouds gradually moved off parts of the crowd were soon sitting in that glorious autumn sunshine for which Canberra is famous. 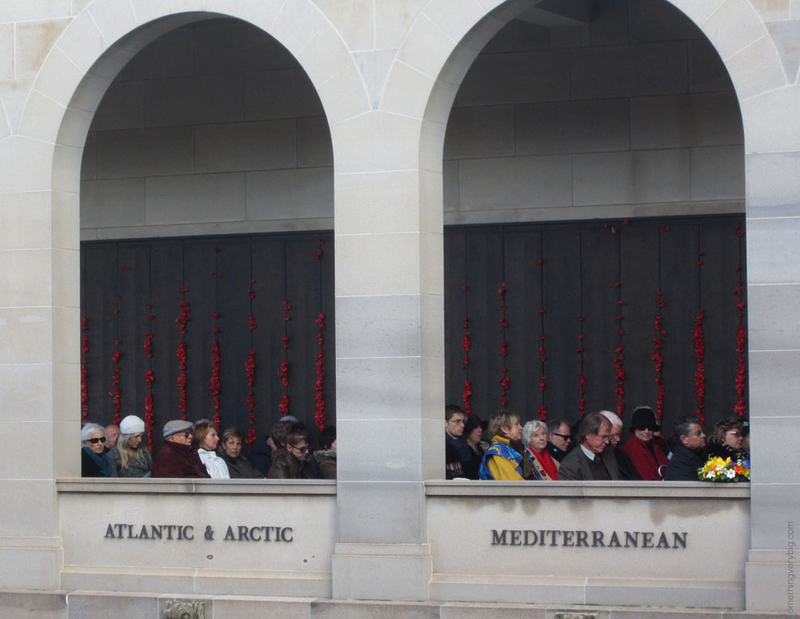 The Commemorative Area was a spectacular location for the ceremony. 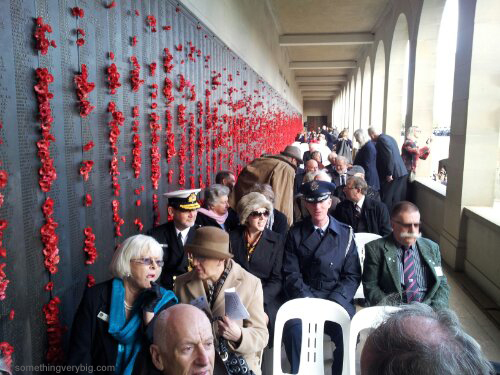 The crowd was sitting underneath the thousands of names on the Roll of Honour. A statue of an airman, on the eastern side, in turn cast his bronze gaze down onto the gathered crowd. 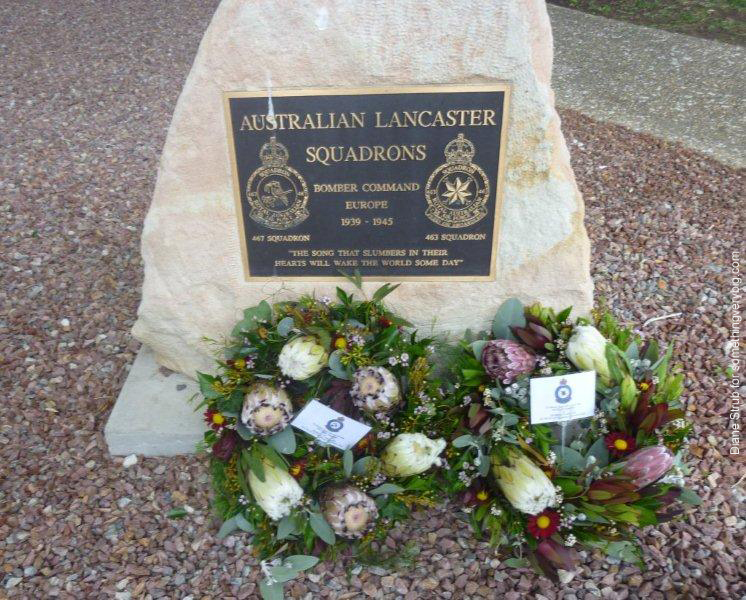 To the rear, immaculately dressed members of the current iterations of 460 and 462 Squadrons, Royal Australian Air Force, were lined up in parade order. 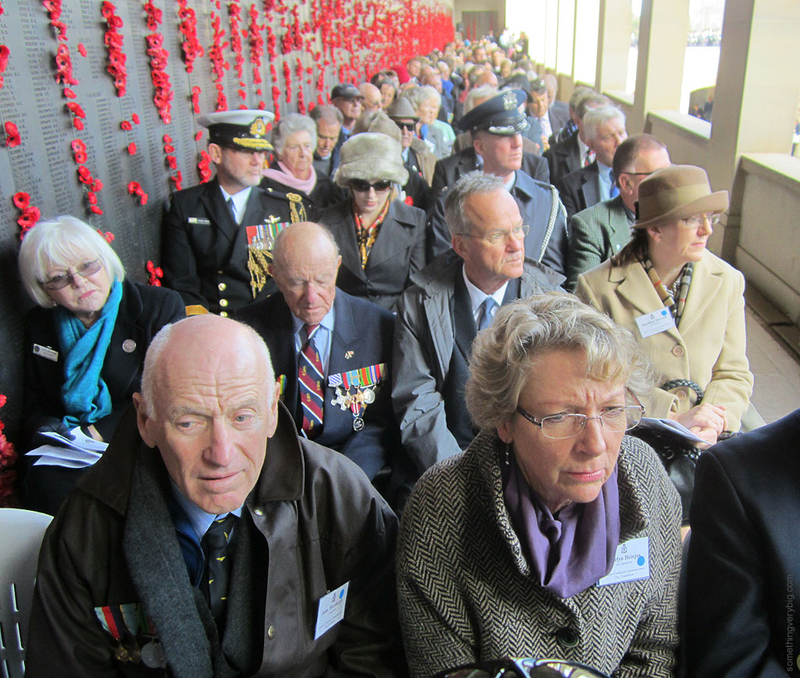 Those veterans who could were invited into the Hall of Memory to watch and take part in the wreath-laying, at the Tomb of the Unknown Australian Soldier. As the bugler sounded the Last Post, the notes echoed off the cloisters and faded away to silence. The singing of the Australian National Anthem, with the support of the Australian Rugby Choir, was spine-tingling stuff. The ceremony was enhanced by the atmosphere of the place it was in. Here is their spirit, in the heart of the land they loved; and here we guard the record which they themselves made. 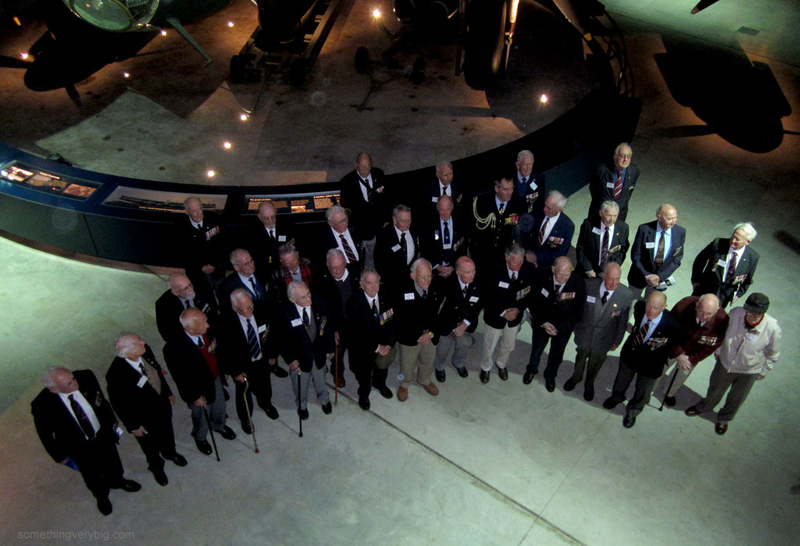 Some of those who made that record, of course, were the veterans of Bomber Command. And then to lunch. Once again, the networking and reunion opportunities offered at this function for someone like me in this country are second to none. Among others, I met a Mosquito navigator named Alan Beavis, and his good mate Alan Pugh, who was training at 1661 Heavy Conversion Unit (Winthorpe – Jack Purcell was there in 1943) at the end of the war. And of course I also caught up with many of the usual suspects again – Don and Ailsa McDonald, the three other Dons Southwell, Huxtable and Browning, Keith Campbell, Harry Brown and Tommy Knox (the latter commenting to me, ‘you can really see it this year… age is certainly catching up with them!’). There was some good discussion on a few potential projects for the next couple of years, much reminiscing and many stories. The Southwells dropped me off at the airport again, and I flew home to Melbourne with a notebook full of ideas and addresses to follow up on. 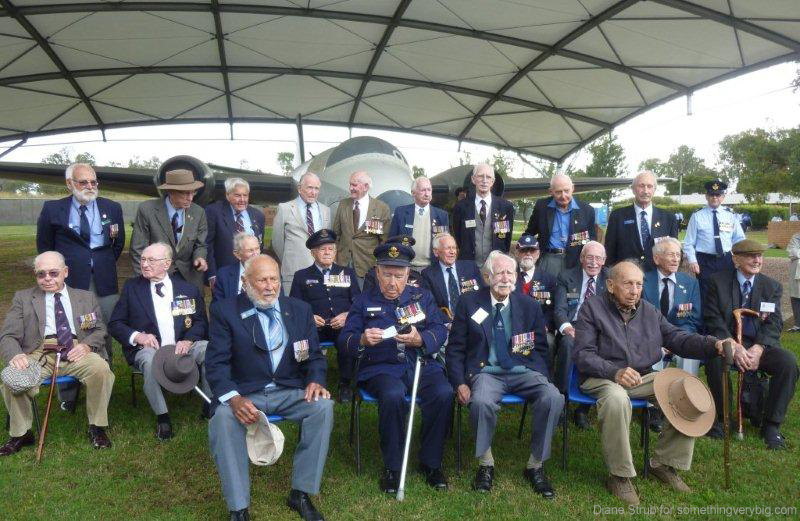 Bomber Command, over the last few years, is finally beginning to see some recognition for its deeds during the Second World War, and acknowledgement of the legacy it left. This was a common theme among many of the speakers at the weekend this year. Peter Rees (who recently published Lancaster Men and is rumoured to be planning a follow-up for the next couple of years) spoke briefly at the lunch and cited this as one of his key motivations. Air Marshal Geoff Brown, current Chief of Air Force, also gave a good talk at the lunch about what today’s Air Force can learn from the bomber offensive. His main points were that a coalition of nations in a common cause is far more powerful than trying to do it alone, a reminder of the importance of close links with technological and research organisations, how vital it is to gain and maintain control of the air in a combat scenario, the continued value of electronic countermeasures and the critical importance of teamwork and people all united by a common purpose and common aims. He effectively demonstrated that, while the airmen of Bomber Command fought their battles so long ago, and while they fought a battle so unique in scale and circumstance, what they did has continued relevance in current operations – and that in that very practical way their legacy will live on. Remembering the history – the raids, the stories, the men – is of course vital. But learning from that history and applying the lessons in practical ways in modern times can also form part of the legacy of Bomber Command. It is far too late for most of those who served, but I hope that some of the veterans who were in Canberra over the weekend can take some comfort in the knowledge that this legacy is living on and will continue to do so. 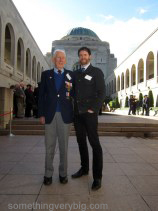 A photoset by the Australian War Memorial’s official photographer is available to view here. Slight change in location due to the rain in Canberra, but the annual Bomber Command ceremony is about to begin at the Australian War Memorial. Full report to come later but here’s a quick photo to start off.